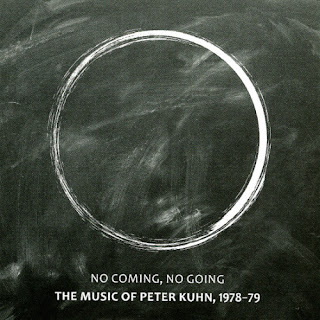 Peter Kuhn, reedman extraordinaire, was poised to become a major star in the firmament of free jazz in 1978-79. Personal problems got in the way and he disappeared from the scene. Now he is back, healthy and strong. This issue, No Coming, No Going: The Music of Peter Kuhn, 1978-79 (No Business 2-CD) is for CD 1 a WKCR broadcast of Kuhn on B-flat and bass clarinet, Denis Charles on drums, William Parker on bass, Toshinori Kondo on alto horn and trumpet and Arthur Williams on trumpet that became the album Livin' Right. It was out for a time back then on Peter's own label--and it is great to be able to hear it again. I would venture to call it a forgotten classic of the era, a marvel for all concerned. The music is a series of three well conceived Kuhn compositions, with some very swinging Denis Charles and fundamental William Parker. On top of that everyone gets a chance to have their say here but ultimately Peter stands out with the three horns together doing some excellent collective improvs as well. The second disk consists of an extended duo recording of Peter on B-flat and bass clarinet and tenor sax and Denis Charles on drums. It was a 1979 concert at the New England Repertory Theater in Worcester, Mass that was broadcast at the time on WCUW. This is a creative two-way effort as interesting for what Denis was doing (he was a great drummer!) as well as what Peter conjured out of his horns. If Livin' Right is the more exciting of the two, the second CD is nonetheless a very nicely done gathering of the duo and a documented revelation of the extended artistry of Peter and Denis in those days. I most certainly recommended this one for your new thing collection. Peter was doing important work. Happily there is a brand new New Business album out with the latest music from Peter and a trio that I will cover in a couple of days!